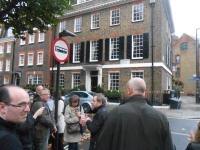 The recent (October 20th 2013) "Prisoner" and "Danger Man" tours organised by Dave Lally of the London Prisoner Group were as always a great success, with fans travelling from all over Europe to attend. Even in rainy weather over two dozen people joined the afternoon "walkabout" which visited over 20 of the series' locations from several episodes and the opening titles. A photo report on the event can be seen HERE, with a brief video clip HERE, and good news from Dave is that the twice-yearly tours will continue into 2014 and beyond, with Sunday 6th April 2014 confirmed as the first of next years events.